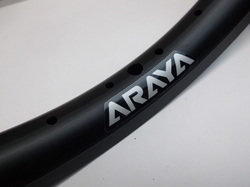 Araya Aero BMX Rim. Double Skin. Weight - approx. 405 grams. The original Araya Aero rim introduced in the early 1980's had a legendary following. The first alloy BMX rim to take advantage of a truly strong aero shape whilst maintaining a relatively light single skin. It was bombproof. Now for 2012 the profile gets a 21st century makeover. Taking advantage of new extrusions the rim has the box section strength of a double skin, but a reduction in weight. This version has CNC machined sidewalls for super responsive braking and can be used on front and rear. It is available currently in anodised matt black finish and 36 spoke holes but other variants are set to follow. Watch for the new brakeless front wheel version coming soon.